Dhaka, Sep 1 (Just News): Jatiya Party Chairman HM Ershad today expressed his skepticism over the Election Commission’s decision to use Electronic Voting Machines (EVMs) in the upcoming general election and underscored the need for more rectification of the decision. However, Ershad, also special envoy to Prime Minister Sheikh Hasina, said his party will clear its stance over the issue through an extended meeting to be held on Wednesday. Amid strong opposition from one election commissioner, the Election Commission on August 30 decided to send a proposal to the government for amending the Representation of the People Order (RPO) so it can use Electronic Voting Machines (EVMs) in the national election to be held at the end of December. The JP chief also asked the authorities concerned to take opinions from all political parties before using the system in the elections. “Many people in the country still cannot put thumb impressions. 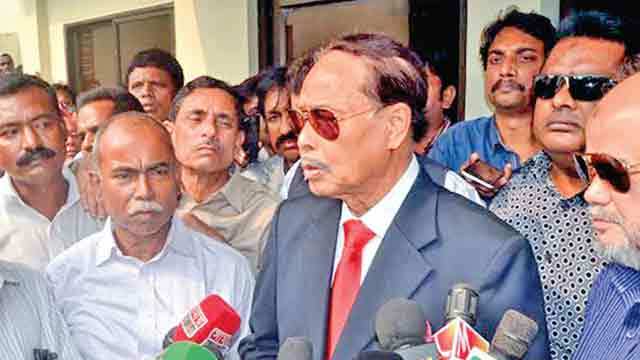 How will they vote by pressing the button of EVM?” Ershad said.